The most happy veg seller I have ever come across - and I am amazed at the variety he has on offer! Known in Cantonese dialect as "Pak Kak", North Point offers one of the most interesting corners you can visit in Hong Kong. Min Nan is also a popular language for this hub of small business, as many people of Hokkien descent settled here after escaping from political upheaval in south-east Asia. Another group, comprising Shanghainese, came here after the Communist Revolution of 1949; their legacy includes the Sunbeam Theatre offering Chines opera performances and the Kiangsu and Chekiang Primary School, the first educational institution to offer instruction in Putonghua (or Mandarin). North Point was also used for a prisoner of war camp by the Imperial Japanese Army. The Hong Kong Electric Company also set up a significant power station in the early years of the 20th century. 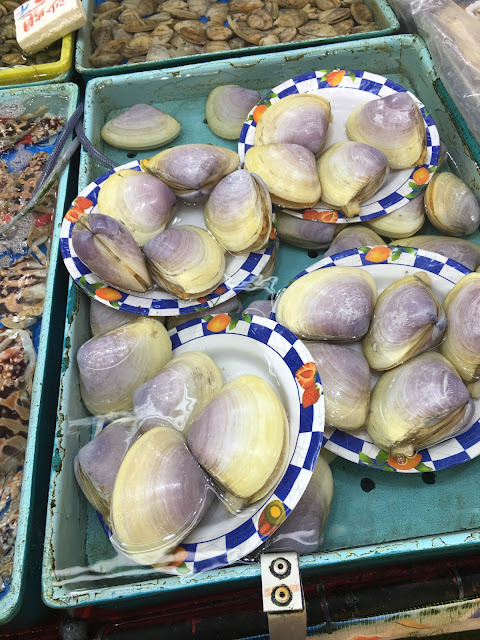 Fresh and delectable seafood can come hard by or are charged at expensive prices in the world's largest cities, but at North Point, one cannot help buying some. Housewives, maids and others are like the early birds who can pick the best "worms" - in this case, the freshest, the best looking and the better quality produce. The best culinary delights here can be traditional, authentic and down to earth. We saw desserts (or Tong Sui), hot pots, custard tarts, roast meats, egg waffles, stir fry veg, steamed seafood, snacks, biscuits, dumplings, preserved eggs and more. A good option is to also head to Java Road, where the Cooked Food Centre distinguishes itself by the Tung Po Restaurant. On the other side of the foodie spectrum, the Michelin Star winning Lei Gardens has a branch in North Point offering delectable Yum Cha sessions. Yue Restaurant at the City Garden Hotel is also noted for reliable Cantonese cooking with quality standards. In China, the use of red coloured lights accompany the butchers - and this can be seen as well in south-east Asia. 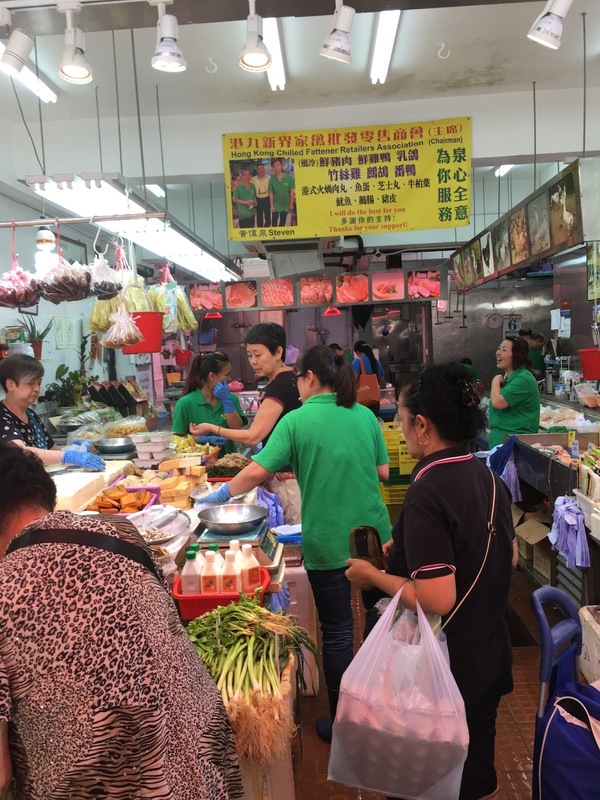 The wide variety of fruits on sale in North Point - bananas from Fujian, cherries from the USA, rambutans from the Equator, longans and citrus fruits. Located on the eastern districts of Hong Kong Island itself, North Point is not difficult to get to - we just jumped on to the two level and narrow classic Trams that have been operating for untold years. As our Tram approached North Point itself, I could feel the buzz, the crowdedness and the vibes in even more intensity. As the Tram was about to turn into a curve, we got off - mind your head on the narrow stairs if you are coming down from the upper level. We were fortunate to just step out at the start of the street with the markets - Chun Yueng Street. I was truly captivated by the eyes of this crab variety - the seafood is so fresh we came across an active fish shaking water all over the customers! No raw chicken meats are sold outdoors in Hong Kong - and their absence is so noticeable in North Point. The ghastly experience with SARS more than a decade ago, coupled with the penchant for bird flu to raise its ugly head during the cooler winter months - has made the SAR Government very strict about the handling of chicken meat. You can also get to North Point on the MTR subway lines (Island Line or Tseung Kwan O Line). North Point is a walk about place - apart from the markets, try covering at least Java Road, Tin Hau Temple Road , Tsat Tsz Mui Road, Tong Shui Road and Wharf Road. There are also other educational institutions of note in North Point - the Hong Kong Japanese School and the Chinese International School are both on Braemar Hill. The North Point markets do remind me of Shantou streets, in a city up the coast of Guangdong. There is an adrenalin of the people moving about and working, buying and selling, walking and watching - all this can at times be lost in large swaths of territories and nations which have less urgency and more comfort in the course of daily life. I can envisage that the residents here may not need to cook, as in other parts of Hong Kong where freshly cooked food is so easily accessible - and there is no need to keep a fridge or freezer at home. We dropped by a pop up shop selling IT accessories - and the lady was friendly in attending to us. There may not be many fancy contemporary hipster barista cafes at North Point - I did not come across any - but it is all right, for the delights of North Point continue to be unique in a fast changing world. Fishballs, rolled yummies with bean curd skins, calamari, octopus, dried shrimp and more - some of the essential ingredients in southern Chinese cooking. 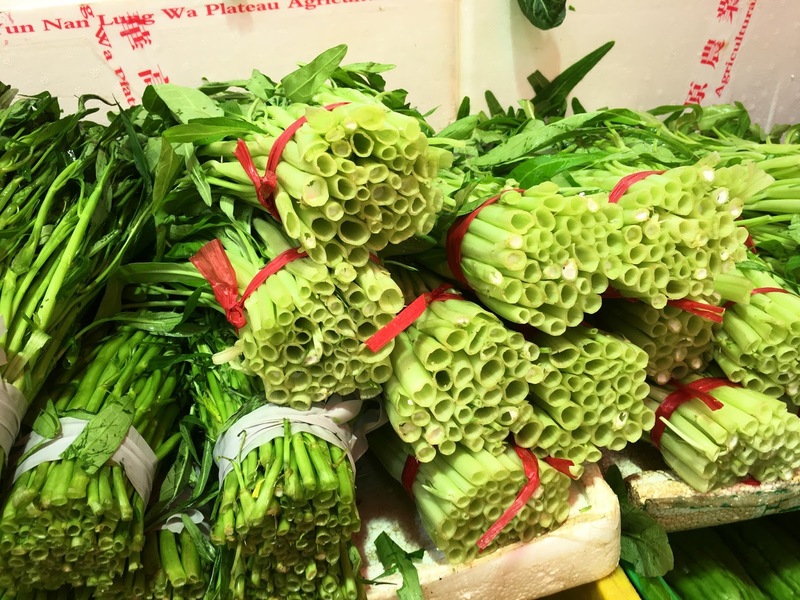 Asian vegetables are now mostly sourced from Guangdong province.